A noble Vino Nobile di Montepulciano. 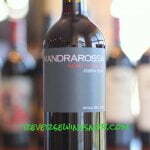 80% Sangiovese with the balance a mix of Canaiolo and Mammolo from Montepulciano, Tuscany, Italy. Available for as low as $25 (Saturday Splurge). 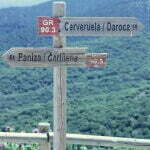 “The Fattoria del Cerro Estate is located in Montepulciano, a renaissance village about 39 miles south of Siena, in Tuscany. With a state of the art cellar and winery, the 1410 acre estate has 385 acres of vineyards, and is marked by the 15th century “Villa Grazianella”, since 1978 Fattoria del Cerro has produced the most important wine of the area: Vino Nobile di Montepulciano; 80% aged 2 years in Slavonian oak casks, 20% in 60 gallon in French oak barrels. This rich well balanced wine with a smooth finish is made from 80% Prugnolo Gentile (a clone of Sangiovese) and 20% blend of Canaiolo Nero and Mammolo. We recommend serving it with red meat and medium-aged cheeses. Vino Nobile di Montepulciano is one of the oldest wines in Italy. As we’ve noted before, Vino Nobile di Montepulciano is made in and around the city of Montepulciano but does not actually contain any Montepulciano grape. 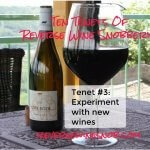 Instead it is made primarily of Sangiovese. Today’s wine is a Riserva which means it must spend at least 3 years aging before release, at least one of which must be in oak. 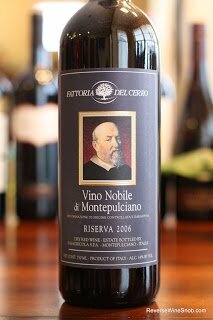 The 2006 Fattoria del Cerro Vino Nobile di Montepulciano Riserva begins with a complex aroma of black cherry, plum, violet, a little anise and other spices, plus a touch of smoked meat and vanilla. 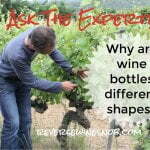 Tasting the wine reveals smooth, savory flavors similar to the bouquet. Lots of spice comes out, especially near the finish. Nice, lush tannins help complete this really elegant wine. The finish is dry and long. A noble Vino di Nobile Montepulciano!